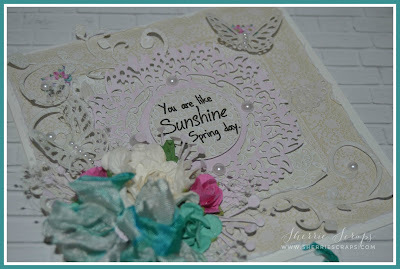 Today I have a pretty card to share~I used gorgeous papers from Lemon Craft for the base layer~Just Love Me collection. I ordered this lovely paper from my sweet friend, Lisa which you can find right HERE at her Etsy store. I used my DIA to distress the edges of some of the layers. I then added a pretty scallop border to the center of my card with Die Versions Whispers Pretty Borders Die. 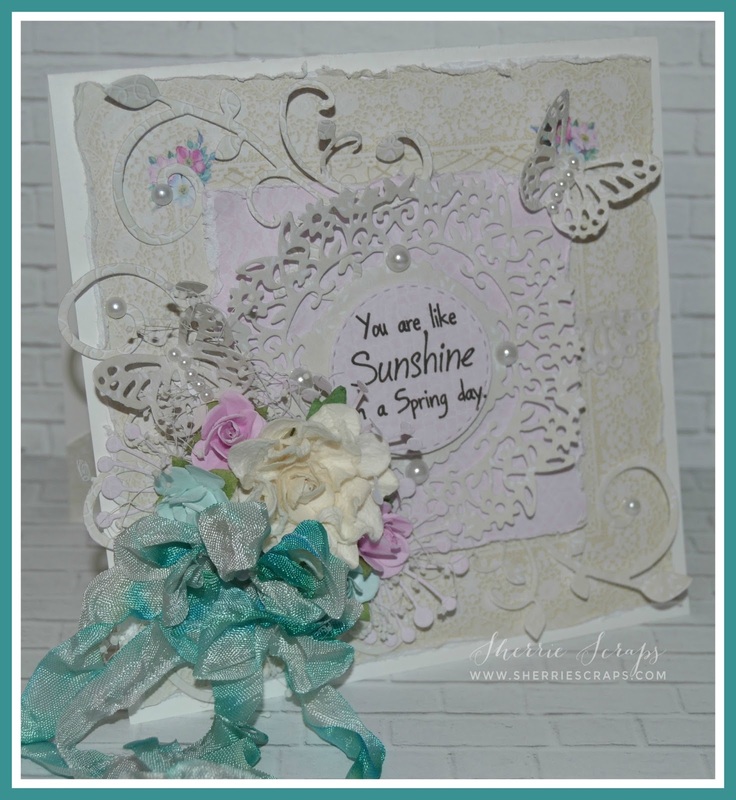 I followed with a Spellbinders Classic Square Dies and then the Die Versions Whispers Spring has Sprung Die. The sentiment is stamped with My Craft Spots Butterfly Kisses (no longer available) onto a circle die and popped with adhesives for dimension. Along the bottom is Die Versions Whispers Flourish Die and under the flowers is the Memory Box Chandra Stem Die and some babies breath. The flowers are from Prima and Recollections. I added Die Versions Whispers Pretty Butterflies Die and then to finish added some pearls. I tied a pretty bow with ribbon from the Tropical Summer Bundle from DL.ART. A little button was added to the center of the bow with Die Versions Wee Petites Buttons Galore Die. 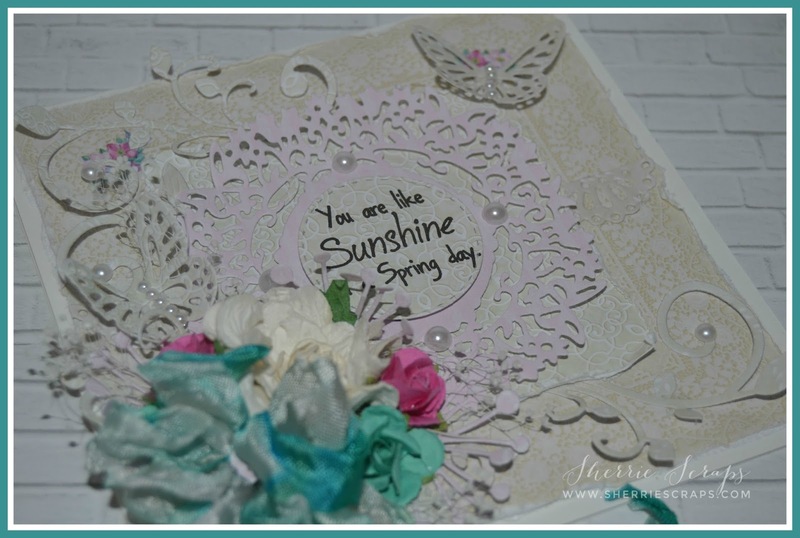 Stop over at Scrapy Land to check out all the inspiration by the DT and then come back and join in on the Spring Blooms theme challenge using a brand of die Scrapy Land carries. Can't wait to see what you create! Just breathtaking, Sherrie! I love the pop of color the bow and floral arrangement make against the muted background. Great use of so many gorgeous die cuts! Hugs! These are GORGEOUS! LOVING the colors and the flowers!!!!!!!!!!!! WOW!!! Breathtaking design in such gorgeously shabby color combo! Love these!!! Elegance at it's best. Love the soft colors and how the flowers and ribbons pop. 2 beautiful cards my friend. Two beautiful cards Sherrie! 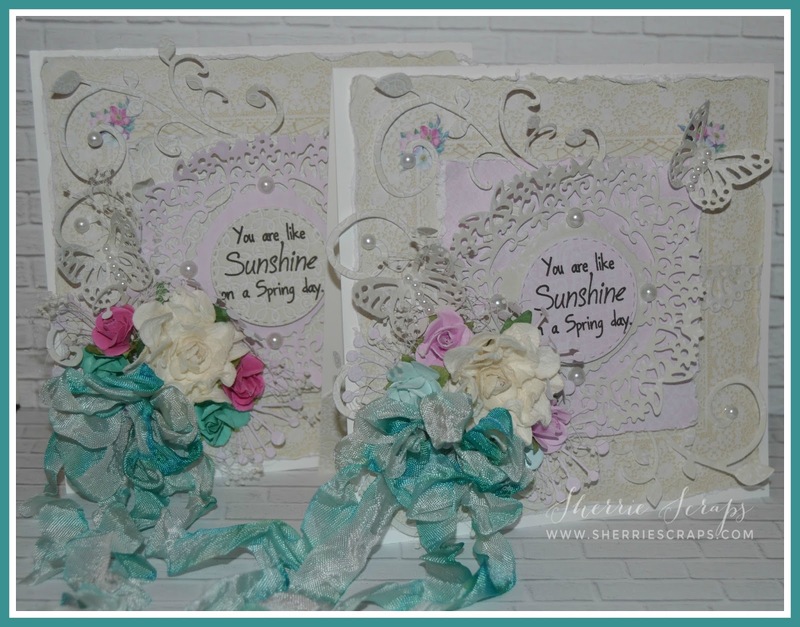 I love the beautiful flowers and ribbon you used to make these gorgeous cards! Gorgeous cards! Love the color combos and the ribbons are so pretty. These are jaw-dropping gorgeous, Sherrie!! Wow!! I love how you've layered the dies!! The flowers and ribbons look so amazing!! You've showcased the papers perfectly (thank you so much for the shout-out!!) I love, love these!! They are works of art!! Your cards are just lovely Sherrie! 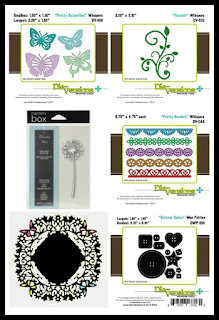 I love the beautiful die cuts and flowers and the distressing! These are both just beautiful Sherrie!!! Great use of dies! What a beautiful cards!! I love the pretty flowers and the pretty papers you used!! Have a great day. I absolutely love both of your Gorgeous cards! !I love all of the awesome dies you used. By the way I also love the flowers & ribbon! Awesome job my friend! I hope your dad is doing better today.My prayers and love go out to you & your family. Gorgeous card! So many pretty elements to see! Love it! Love the vintage, feminine style to these, Sherrie! Wow! Very pretty set of cards! Those dies are so amazing, I am so obsessed with dies right now! Your flowers and ribbon are so gorgeous too! WOW!!! Sherrie, your cards are absolutely gorgeous!! I love that you used a My Craft Spot sentiment too! It's perfect in the centre of your card! So pretty Sherrie! Love the fancy doily and butterflies! Love the beautiful blossoms and bow! Hello my friend, these are just so beautiful! I just love the paper and all your perfect touches! I hope you are doing okay, I have not been able to post anything but please know that you and your family have been in our prayers. My sweet friend, how dearly I have missed you! It has been a tough year with injuries, but I am back to the crafty world I missed so much. I believe (and hope with all of my heart) that it is for good this time, even if it's a lighter schedule. Please know that you and your family remain in my prayers! As for your card, it is exquisite! Oh gosh, it is shabby chic beauty in the purest form. The layering is so pretty and I adore every sweet facet. LemonCraft papers are gorgeous, especially when used to such perfection. (By the way, Scrapy Land is so blessed to have you!) Have a wonderful night, Sherrie! Absolutely gorgeous and I adore the shabby chic feel. This is perfect for our 9th ‘ATG with CREATE WITH TLC’ challenge. Thanks for sharing your talent with us. Good luck and hope to see you play with us again. Wow! This is absolutely beautiful!! Love all the texture and demention!! Awesome job on this card Sherrie, ❤️ It! So pretty Sherri! I love the soft colours with the pop of green in the ribbon! Stunning spring card ! Love it !